To Cite: Hanafi M Q, Azizi R, Sadeghipur A. Findings of Cerebral Computerized Tomography Scan in Epileptic Children Hospitalized in Ahvaz Golestan Hospital, Jentashapir J Health Res. 2017 ; 8(5):e65515. doi: 10.5812/jjhr.65515. Background: Epilepsy caused by abnormal brain discharges is one of the most common neurological diseases. The main goal of imaging in epilepsy is primarily to identify underlying abnormalities, such as vascular malformations and tumors, that may have a specific treatment and, in the next grade, syndromic and etiologic diagnosis of epilepsy. In this project, the findings of computerized tomography (CT) scan of children admitted to the neurology department of Ahvaz Golestan hospital during the years 2012 and 2013 with final diagnosis of epilepsy were studied. Methods: This retrospective study was conducted on patients, who were admitted to Ahvaz Golestan hospital with a final diagnosis of epilepsy at the pediatric neurology department. By referring to the archives, all records of the patients were examined and the data were collected based on gender, age, CT scan, and abnormalities of the patients. For the descriptive analysis of data, tables and figures were used. Data analysis was performed using the SPSS 20.0. Software. Results: In this study, 85 patients with a mean age of 5.69 ± 4.05 years, the youngest of whom was one month and the oldest was 15 years old, were studied. Also, 44 of them were female and 41 were male. 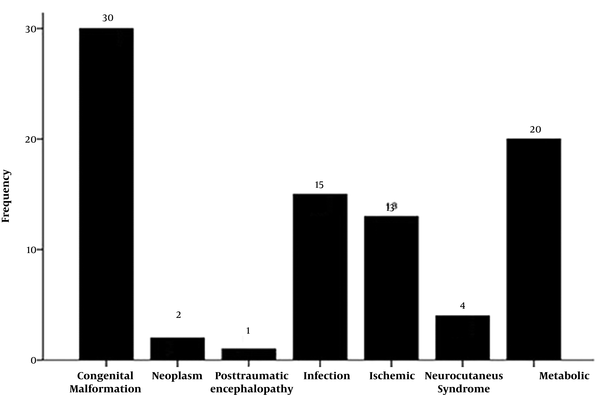 Among 34 patients with non-normal CT scan, 15 cases (44.1%), seven (20.6%), six (17.6%), three (8.8%), two (5.9%), and one case (2.9%) had congenital anomalies, nervous system infections, ischemic- hypoxic processes, neurocutaneous syndromes, neoplasm, and post- traumatic encephalopathy, respectively. Conclusions: According to this study, given that CT scans are performed only in certain cases with epilepsy and are not used to detect the cause of epilepsy, in patients with any change in duration and severity or type of epilepsy, it is required to reject other underlying causes or to expand and create possible life-threatening causes. Epilepsy or recurrent episodes of seizure due to abnormal brain disorder (1-3) is one of the most common neurological diseases with an incidence ranging from 0.3% to 0.3% and a prevalence of 10-5. The number of people per 1000 people is estimated (4, 5). This disease causes disruption in everyday life with many types and is divided to a primary generalized seizure, a simple focal seizure, and a complex with secondary emission seizure (6). Nowadays, many pharmaceutical therapies can be administered for patients with epilepsy and more recent treatments are available for treatment, yet a good percentage of patients are still experiencing seizure attacks, despite the use of multiple drugs, and in fact, these people are resistant to seizures (7). There are various definitions for resistant seizures (8, 9). According to one of these definitions, if there is one seizure per month for at least two years, despite the presence of three drugs, the complication is called resistant seizure (10, 11). Epilepsy is not inherited in most cases and in other words its inheritance is very low. In some patients, factors, such as insomnia, long starvation, stress, light, especially flashing light, alcohol, some so-called cold foods, and high temperatures can increase attacks (6). In most advanced countries, the incidence of epilepsy is 40 to 70 cases per 100 000, yet in developing countries, this rate ranges from 100 to 190 cases per 100 000 (about 2.5 times). In general, the results of studies show that 1.5% to 5% of people in the community have epilepsy. In a study on patients in hospital and clinics, epilepsy was found in only one-third to one-fourth of cases. Prenatal injuries, mental retardation, cerebral palsy, brain stroke, cerebrospinal fluid infections, cerebrovascular accidents, brain tumors, Alzheimer's disease and the use of alcohol and heroin all increase the risk of epilepsy. Imaging is of particular importance in the study of epileptic patients, especially in treatment-resistant epilepsy and patients, who are candidates for surgery. Performing brain computerized tomography (CT) scans is useful in identifying tumors and other constructional disorders that result in seizures, yet the result of CT scan in most epileptic patients is normal. Brain imaging is required for epileptic patients in the following cases: 1) in a person with focal seizure attacks (by clinical description or EEG); 2) occurrence of any type of seizure in newborns or adolescents; 3) the presence of focal neurological symptoms or neuropsychiatric disorders; 4) failure to control seizure with medications; 5) repeated seizures after a period of medication control; and 6) change in the form of epileptic seizures (4, 5). Brain CT scans are recommended for patients, who have been hospitalized with a final diagnosis of epilepsy in cases of traumatic brain injury, intracranial hemorrhage, intraocular calcification, brain tumor, and diagnosis and follow-up of brain abscess. Lack of timely treatment causes a disturbance in the seizure center (seizure retention center) functionally and physiologically, and if left untreated, it may cause structural changes in the brain tissue and other areas of the brain and reduce the speed the individual's intellectual function. Therefore, the treatment of these patients is mandatory (6, 7). Treatment for epilepsy is long-lasting and lasts about two to three years, and after this period, treatment is complete. A very small percentage of patients may receive long-term treatment (4). In this project, the findings of CT scan of children admitted to children's neurology department of the Golestan hospital in Ahvaz during the years 2011 to 2013 with a final diagnosis of epilepsy were reviewed. Computerized tomography scan evidence included in the files were attributed to existing anomalies. For descriptive analysis of data, tables and figures were used. Data analysis was performed using the SPSS 20.0 software. In this study, 85 epileptic patients were examined, of which 52 (61.2%) had CT scans. Out of 52 cases, 18 patients (34.6%) had a normal CT scan and 34 (65.4%) abnormal CT scans (Table 1 and Figure 1). 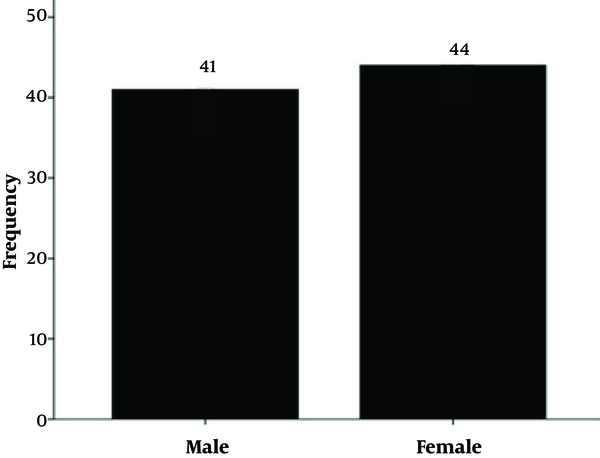 In this study, the mean age of the patients was 5.69 ± 4.05 with a minimum age of one month and a maximum age of 15 years (Table 2), of which 44 patients were female and 41 patients were male (Table 3 and Figure 2). Of the 85 patients, 30 (35.3%), 20 (23.5%), 15 (17.6%), 13 (15.3%), 4 (4.7%), and 2 cases (2.4%), and also 1 case (1.2%) had congenital anomalies, metabolic diseases, nervous system infections, ischemic-hypoxic processes, neurocutaneous syndromes, neoplasm, and trauma-induced encephalopathy, respectively and those with a final diagnosis of epilepsy were hospitalized (Table 4 and Figure 3). In this study, out of 34 patients with non-normal CT scan, 15 (44.1%), seven (20.6%), six (17.6%), three (8.8%), two (5.9%), and one patient (2.9%) had congenital malformations, nerve infections, ischemic processes-hypoxic, neurocutaneous syndromes, trauma-induced encephalopathy, respectively, and after a final diagnosis of epilepsy, they were admitted to the hospital. In this study, the most common findings in CT scan were related to each disease, including cerebral dysgenesis (cerebral atrophy), ischemic-hypoxic encephalopathy, and local ischemic lesions (Table 5). Epilepsy (12) is a set of chronic neurological disorders that are characterized by an epileptic attack (13). These attacks may be very mild and almost unidentifiable, or vice versa, and are prolonged and with severe vibration (6). The primary goal of imaging in epilepsy is to identify underlying abnormalities, such as vascular malformations and tumors, that may have a specific treatment and, in the next degree, syndromic and etiologic diagnosis of epilepsy (14). With the arrival of CT scan to the diagnostic measures, a huge change has taken place, and given the relatively easy access to this paraclinical device over the past 10 to 15 years, doctors recommend it more easily and faster (15). The purpose of this retrospective study was to examine the results of children's brain CT scans and determine the level of abnormalities using a CT scan. In this study, 48.2% of patients were male and 51.8% were female, in a study in Turkey that investigated the cause of developmental delay in 247 children, 55% were male (16), and in a study in Hamburg, performed to determine the diagnostic accuracy of brain CTs, 40% of patients were male (17). In this study, 85 patients with epilepsy were examined, of which 52 (61.2%) had CT scans. Out of 52 cases, 18 patients (34.6%), had a normal CT scan and 34 patients (65.4%) had non-normal CT scans. 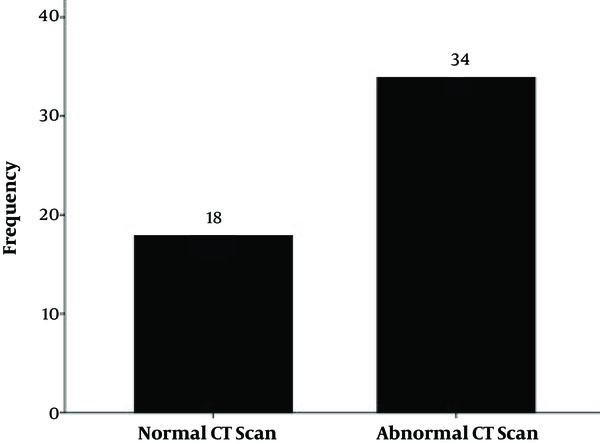 In a study by Fallah and Abedi in Yazd, CT scan was performed on 100 patients, of which 61% had normal CT scans (18). In the current study, the rate of having a normal CT scan was reported less. This difference may be due to differences in age or the study approach, which was done only on epileptic patients with underlying illnesses. However, in a study by Taghdiri (19) on infants, having non-normal CT scan findings were about 60%, which is statistically consistent with the current study. In a study by Vattipally and Bronen, it was found that all non-normal CT scan findings were not associated with seizures. Cystic lesions, lacunar infarction and intravenous anomalies are not known as the main cause of seizure (20). In this study, out of 34 non-normal CT scans, 15 (44.1%), 7 (20.6%), 6 (17.6%), 3 (8.8%), 2 (5.9%) and 1 (2.9%) were with congenital anomalies, nerve infections, ischemic-hypoxic, neurocutaneous syndromes, neoplasms and trauma-induced encephalopathy, respectively, and after a final diagnosis of epilepsy, they were admitted to the hospital. In a study by Afshari (21) on epileptic patients in Kermanshah, out of 905 patients, 780 had normal brain CT scans. In the age group of under 10 years old, there were 108 patients, of which 93 patients (86.1%) had a normal CT scan. Of the 15 patients with non-normal CT scan, 6 (5.6%), 6 (5.6%), 2 (1.9%), and 1 case (0.9%) had cerebrovascular accidents, cerebral cortex malformation, space-occupying lesions, and non-specific findings that were in part in accordance with the current study. In the present study, cerebral atrophy (30%) was the most common lesion in CT scan. In a study from Saudi Arabia, cerebral atrophy was the most common lesion (37%) in CT scan (22). In India, circular disk lesion was more common, which was seen in 32 out of 79 abnormal CT scans (23). In another study from India, 100 children with epilepsy were examined, and the most commonly observed abnormalities in the CT scan were circular disk lesions (24). According to the radiologist report, 34% of the patients, who had a final diagnosis of structural disorder of the brain, had normal CT scans. In explaining how structural disorder of the brain was diagnosed by the normal brain CT scan, it should be noted that subarachnoid space enlargement that may indicate a mild cerebral atrophy or a part of normal variations, could be interpreted only based on the positive points of the history report (evolutionary delay, etc.). Accordingly, a radiologist, who does not have a patient's history, reports that it is a natural sign that emphasis also on the point it will be much more accurate if a detailed history report of the patient is included in the request sheet for CT scan. This was also emphasized by a study from Brazil (25). According to this study, since CT scans are performed only in certain cases of patients with epilepsy and are not used to determine the cause of epilepsy, therefore, in patients with any changes in duration, severity or type of epilepsy, in order to rule out other underlying causes, or to expand or determine possible life-threatening causes, CT scan is required for each patient. Although in many cases, a CT scan is normal in patients with epilepsy, it can be used as a diagnostic tool for focal or repeated seizures, infants below the age of one with a seizure, waking up with headaches, or accompanied with non-normal nerve exam, a severe headache with acute onset, change in form of a headache, meningitis with abnormal sensation or abnormal neurological examination. The researchers can recommend further studies on CT scan evidence in patients with epilepsy at other medical centers of the country, as well as a greater sample size. 1. Menkes JH, Sankar R. Paroxymal Disorders. In: Menkes JH, editor. Textbook of Child Neurology. Baltimore: Williams and Wilkins; 1990. 2. Aicadi J, Shorvon SD. Intractable Epilepsy. In: Engel J, Pedley TA, editors. Epilepsy: A Comprehensive Textbook. 1. Philadelphia: Lippincott-Raven; 1997. 3. Daras M, Bladin P, Eadie M, Millette D. Historical Perspectives. In: Engel J, Pedley TA, Aicardi J, editors. Epilepsy: A Comprehensive Textbook. 1. Philadelphia: Lippincott-Raven; 1997. 4. Engel J, Pedley TA, Aicardi J. Epilepsy: A Comprehensive Textbook. 1. Philadelphia: Lippincott-Raven; 1997. 5. Lowenstein DH. Diseases of the central Nervous system seizure and epilepsy. In: Fauci A, Braunwald E, Kasper D, Hauser S, Longo D, Jameson J, et al., editors. Harrison's Principles of Internal Medicine. 17 ed. New York: McGraw-Hill; 2008. 6. Fisher RS, van Emde Boas W, Blume W, Elger C, Genton P, Lee P, et al. Epileptic seizures and epilepsy: definitions proposed by the International League Against Epilepsy (ILAE) and the International Bureau for Epilepsy (IBE). Epilepsia. 2005;46(4):470-2. doi: 10.1111/j.0013-9580.2005.66104.x. [PubMed: 15816939]. 7. Kwan P, Brodie MJ. Refractory epilepsy: a progressive, intractable but preventable condition? Seizure. 2002;11(2):77-84. doi: 10.1053/seiz.2002.0593. [PubMed: 11945093]. 8. Berg AT, Kelly MM. Defining intractability: comparisons among published definitions. Epilepsia. 2006;47(2):431-6. doi: 10.1111/j.1528-1167.2006.00440.x. [PubMed: 16499772]. 9. Berg AT. Defining intractable epilepsy. Adv Neurol. 2006;97:5-10. [PubMed: 16383109]. 10. Chang BS, Lowenstein DH. Epilepsy. N Engl J Med. 2003;349(13):1257-66. doi: 10.1056/NEJMra022308. [PubMed: 14507951]. 11. Lüders HO, Comair YG. Epilepsy Surgery. 2 ed. Philadelphia: Lippincott Williams and Wilkins; 2001. 12. Fisher RS, Acevedo C, Arzimanoglou A, Bogacz A, Cross JH, Elger CE, et al. ILAE official report: a practical clinical definition of epilepsy. Epilepsia. 2014;55(4):475-82. doi: 10.1111/epi.12550. [PubMed: 24730690]. 13. World Health Organization. Epilepsy Fact Sheet. WHO; 2016, [cited 2016]. Available from: http://www.who.int/news-room/fact-sheets/detail/epilepsy. 14. Trescher WH, Lesser RP. The epilepsies. In: Bradley WG, editor. Neurology in Clinical Practice: Principles of diagnosis and management. 4 ed. Philadelphia: Butterworth-Heinemann; 2004. p. 1975-7, 54. 15. Menkes JH, Sarnat HB, Moser FG. Introduction: Neurologic Examination of the child and infant. In: Menkes JH, Sarnat HB, editors. Child Neurology. 6 ed. Philadelphia: Williams and Wilkins; 2000. p. 1-32. 16. Baheti R, Gupta BR, Baheti R. A study of CT and EEG findings in patients with generalized or partial seizures in Western Rajasthan. JIACM. 2003;4(1):25-9. 17. Kobashi K. Computerized transverse axial tomography in epilepsy. Bull Yamaguchi Med Sci. 1981;28:127-34. 18. Fallah R, Abedi M. [The evaluation of children brain CT scan results and it's relationship with requesting clinical complaints]. Horizon Med Sci. 2008;14(1):27-32. Persian. 19. Taghdiri MM. [Radiological findings in infants with seizures, according to brain CT scan without contrast in Ekbatan Hospital]. J Hums. 2004;11(4):50-3. Persian. 20. Vattipally VR, Bronen RA. MR imaging of epilepsy: strategies for successful interpretation. Neuroimaging Clin N Am. 2004;14(3):349-72. doi: 10.1016/j.nic.2004.04.002. [PubMed: 15324853]. 21. Afshari D. [Brain CT Scan findings in epileptic patients referred to neurology clinic of Kermanshah]. JKUMS. 2012;16(1):43-8. Persian. 22. Longe AC, Omojola MF. Computed tomographic brain scan findings in Saudi epileptic patients. East Afr Med J. 1994;71(9):567-70. [PubMed: 7875089]. 23. Kumar R, Navjivan S, Kohli N, Sharma B. Clinical correlates of CT abnormality in generalized childhood epilepsy in India. J Trop Pediatr. 1997;43(4):199-203. [PubMed: 9283120]. 24. Kumar R, Kumar A, Kohli N, Pant MC, Govil YC, Sharma B. Ring or disc-like enhancing lesions in partial epilepsy in India. J Trop Pediatr. 1990;36(3):131-4. [PubMed: 2113952]. 25. Novak EM, Terabe F, Nasimoto AL, Carvalho PH, Loper AD, Buchele FS, et al. [Correlation between diagnostic hypothesis and result of cranial computed axial tomography]. Arq Neuropsiquiatr. 2001;59(3-B):761-7. Spanish. [PubMed: 11593279].